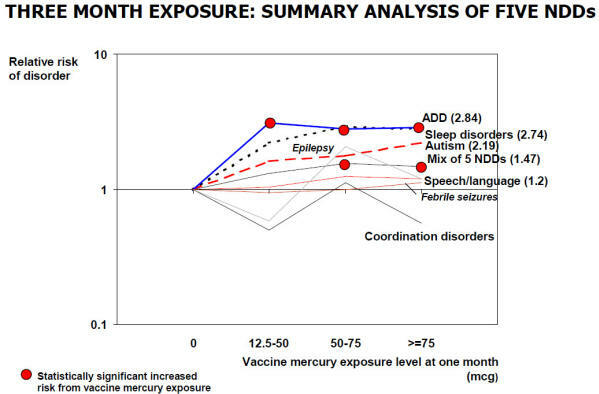 Between February 2000 and November 2003, Thomas Verstraeten and his supervisors at the National Immunization Program produced four separate generations of an analysis designed to assess the impact of vaccine mercury exposures on neuro-developmental disorders in children. With each generation, elevated and statistically significant risks were reduced and/or eliminated. But before these four generations of report were produced, Verstraeten conducted an earlier analysis of these issues in November and December of 1999. He never prepared a formal report on this work, but statistical tables obtained by Safe Minds in a FOIA request (and not previously analyzed) demonstrate large and statistically significant mercury exposure effects that in many cases exceeded the findings of the later reports. 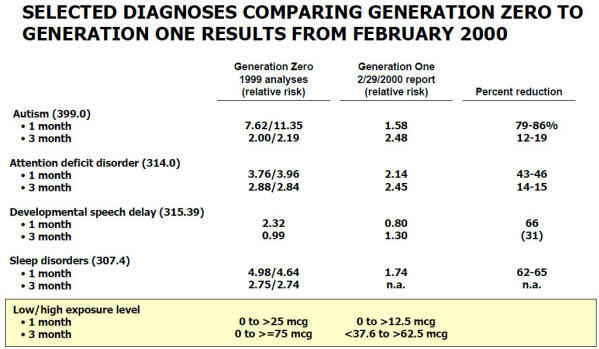 These “Generation Zero” analyses followed a straightforward methodology that was relatively unaffected by biases applied later and was considerably more sensitive with respect to detecting mercury exposure effects than the later reports. • Most notably, these initial analyses compared disease risk in the highest exposure population groups to disease risk in zero exposure population groups. 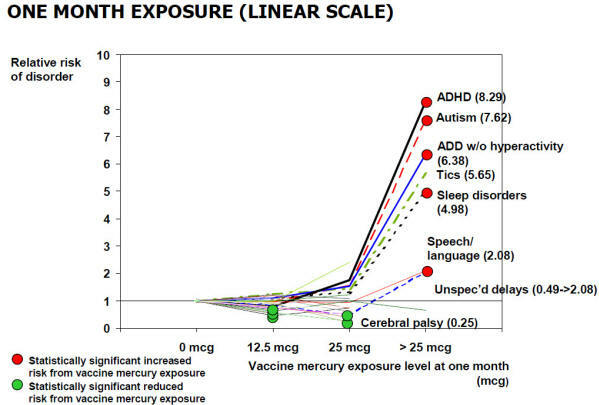 • In addition, the target study population had not yet been subject to numerous exclusions and adjustments applied later, the cumulative effect of which was to reduce the reported impact of mercury exposure on children’s health outcomes. • Relative risks of autism, ADD, sleep disorders and speech/language delay were consistently elevated relative to other disorders and frequently significant. Disease risk for the high exposure groups ranged from lows of 1.5X-2 times to as high as 11 times the disease risk of the zero exposure group. 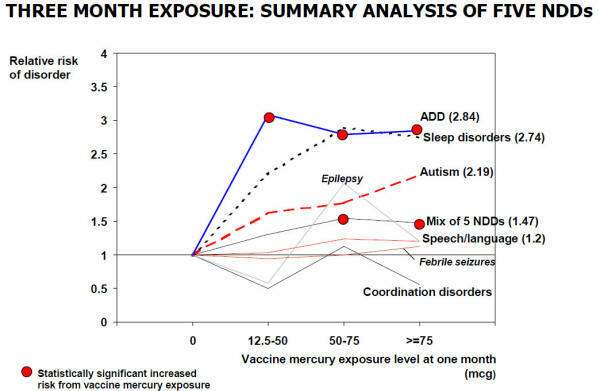 • Many other outcomes showed no consistent effect, while a few appeared to show a protective effect from vaccine mercury exposure (most likely children with these diagnoses were immunized later). 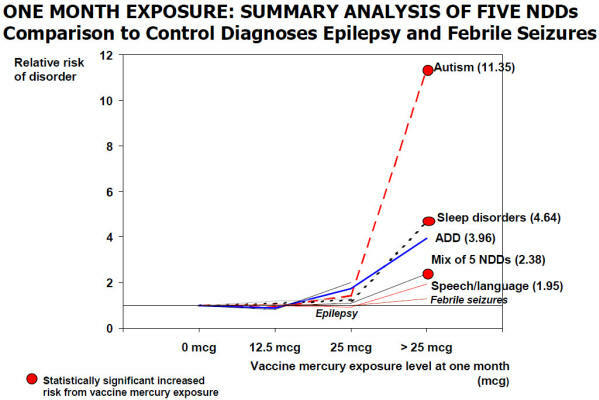 • The strongest effect was for the highest levels of mercury exposure at the earliest time of exposure, consistent with the idea that infant brain development is most sensitive to the earliest exposures. 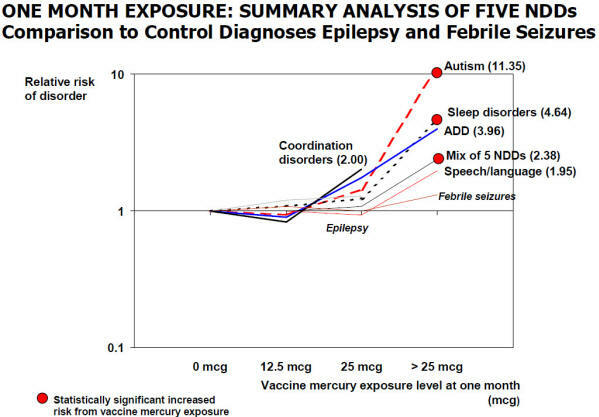 • The elevated risk of autism for the highest exposure levels at one month ranged from 7.6 to 11.4 times the zero exposure level. 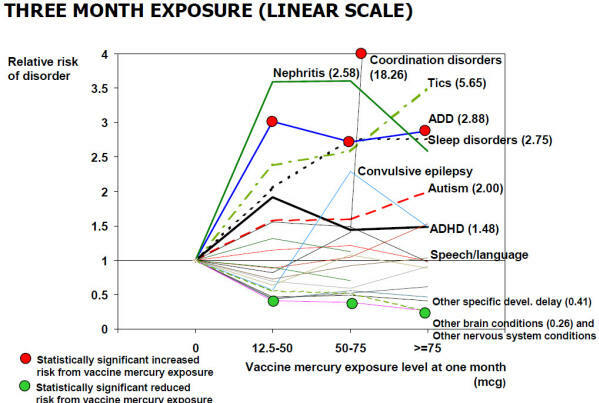 This increased risk level corresponds to the tenfold increase in autism rates seen since vaccine mercury exposures increase starting in 1990. • the exclusion of children with less than two polio vaccines: these children would have been most reliably in the zero exposure group, whereas children with two polio vaccines with low reported mercury exposure would be more likely to have exposure reporting errors. • the elimination of zero exposure categories in general as the referent category for risk assessment as well as the reduction in the measured exposure in the highest category: the smaller the spread between high and low exposures, the more an exposure effect is diluted. Verstaeten’s specific findings revolved around an analysis of a set of distinct ICD 9 diagnosis codes, several with related subordinate codes. These codes covered a range of developmental disorders (presumably selected by Verstraeten) that might plausibly be connected to developmental mercury damage. Verstraeten appeared to run two separate analyses, one reported in late November and another (with a more narrowly chosen subset of disorders) a few weeks later in mid December. The statistical outcomes were broadly similar in these two different data runs, but there are several inconsistencies that have no clear explanation (most notably in ADD/ADHD and “coordination disorders”). 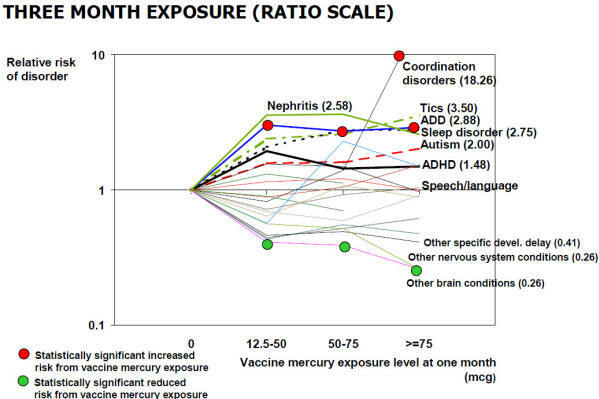 Most measured disorders displayed no association at all with vaccine mercury exposure. These results suggest there is no inherent bias in Verstraeten’s method or sample that produced an elevated risk of disease. Nephritis and nephropathy, although not significant, showed elevated disease risk. Since kidney damage is a known primary effect of mercury exposure, this results is intuitive and potentially important. Relative risks of autism, sleep disorders and tics all remain elevated, at over 2 times the risk in the zero exposure group. • do the later study parameter on stop dates effectively shunt other diagnoses (e.g. autism) into this category? Verstraeten revised his analysis in unknown ways between his first run in November and his second in December. He focused his analysis on five specific disease categories. The general patterns remained the same with a few notable changes. 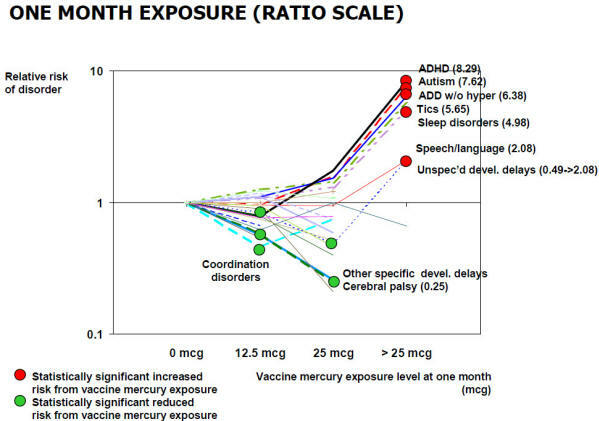 Autism risks were the highest of all the diagnostic codes, with a relative risk at one month of 11.35 between the high and zero exposure groups. Sleep disorders remained significant at one month and ADD risks at three months, while both risks remained elevated in both periods at the highest exposure levels. Speech language disorders were modestly elevated in both periods. Results for coordination disorders changed markedly from November (highly elevated and significant) to December (not significant, even reduced). ONE MONTH EXPOSURE: SUMMARY ANALYSIS OF FIVE NDDS. COMPARISON TO CONTROL DIAGNOSES EPILEPSY AND FEBRILE SEIZURES. THREE MONTH EXPOSURE: SUMMARY ANALYSIS OF FIVE NDDS. Eliminated assessments of risk in the highest exposure groups, lumping these populations in with lower exposure populations. This choice would mask the detection of any threshold effects that might kick in at the highest level. • Fewer comparisons in the later analyses were based on a referent level of zero mercury exposure, many risk assessments bundled reported exposures up to 25 mcg with the true zero exposure group. Introduced “stop dates”, potentially diverting diagnoses like autism to earlier, less severe, diagnoses such as speech and language delays. Many children who receive an autism diagnosis receive other diagnoses along the way. Reduce the size and diversity of the study population, eliminating all but two HMOs. • statistical models of risk (regression techniques, stratification and confounders, etc. ), follow up time, quality of fit measures, etc. Supervisors of such population based studies therefore have wide discretion in the results they choose to report, depending on whether they are interested in reporting a positive or negative finding. In their words and actions, Verstraeten and his supervisors demonstrated clear biases against reporting positive results and made numerous deliberate choices that took positive findings in a single direction, towards insignificance. The pattern of behavior constitutes malfeasance and should not be permitted to stand. It is time to remove the parties involved from their role in vaccine safety assessment and to subject the VSD data base to open and independent review.